Are you craving something sweet, but you do not know exactly what that may be? Have you tried the flavor that this cartridge has to offer? 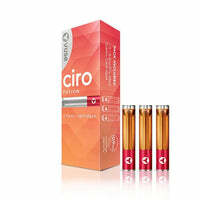 The Ciro Fusion Cartridges are created by VUSE and they are certainly ready to show you a good time. These cartridges will be compatible with the Ciro Vape Pen that is also brought to us by VUSE. When you connect this cartridge to your mod, you should be ready to start indulging right away because they are prefilled with 0.9ml of vape juice. This is will be a decent amount to allow you to appreciate the flavor you choose to vape with. When you finally decide to take a hit, you will notice the fruity mixture that is beginning to make its way into your mouth. There is so much sweetness occurring in your palate that you might start to have a difficult time determining, which specific fruits are the ones that make up this blend. At some point, you will simply give up coming up with assumptions and just enjoy the trip for what it has to offer. There is an option that is going to allow you to purchase three of these cartridges in one package bringing you a total of 2.7ml to indulge in whenever you want. The cartridges are will be non-refillable, which will stop you from putting yourself at risk of making messes. We do not know about you, but sometimes a shaky hand does not come in handy when filling up a tank or a pod. Once one cartridge is done, just pop in another one, and it is that easy! The flavor is great and the power of the mod is going to make everything seem like a dream come true. Do not hesitate to purchase this flavor soon because it is quickly selling out like crazy!